Hey everyone, this blog post marks a change into how changelists will be done from now on. Not only will our steam megathread be updated (which can be found here however the megathread will only be updated once DeamonHunter gets back from his break as I can’t edit his post myself.) but we will make a Steam solo post on each new build too! Not only that, but we will be posting patchnotes on this blog as well. The changelog for the most recent build will always be pinned in our Steam discussions so whenever you’re looking for the patch notes they’ll be pinned in General discussion. Allow user to hide the feedback form in future. Force Download mods when opening Mod Manager. Players are now asked to remove incompatible or banned mods. Added functional bin and stop merchant sites accepting zero value stacks. Added a shelf where modders where modders can have their items spawn in the store. Added effects & actions to dispensers. Added a “Cobble Moss” tile, similar to weeds, for use in adding aesthetic overgrowth to non-farmland tiles. Add gating to totem requirements and display ??? if the quest isn’t active for that player. Game now displays a lag notification. Added option to auto-pickup items within a certain distance around the player. Added –disableFullscreen and –disableSliders commandline options. Game now detects duplicate keys in json blob files. Added alt stages to rare mushroom plant to accommodate rotations. Game now checks if the player is looking at a villager before throwing throwables. Town hall pedestal dock is now available to buy. Added contentbuilder check for category concept & fix missed villager regards. Added additional check to Cirahnas part in Oscar’s junk queen quest. Removed the old postbox from the catalogue. Allowed many of the common grasses to spawn mixed seeds, increased mixed seed rate slightly. Stop interrupting action cancellations when fainting. Added some missing essentials to the building store. Removed fossil category from polisher. Removed questItem status from giant mushroom since you can get it as many times as you need. Player is now prevented from sleeping during the morning. Apply and persist random villager likes. Made fairies emissive to match lore. 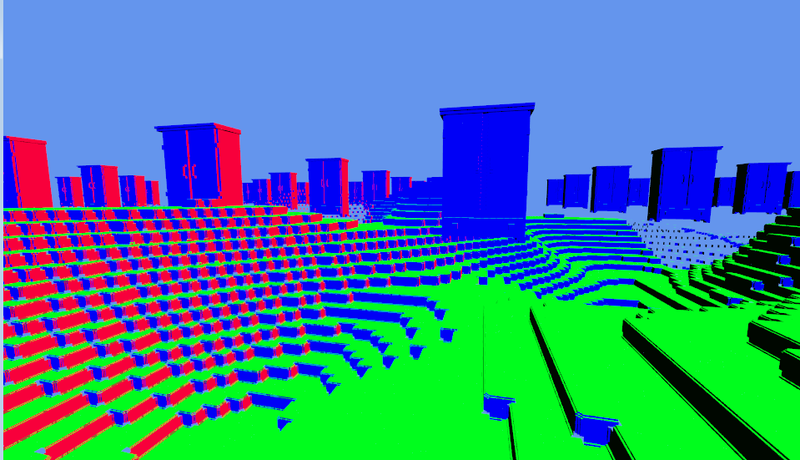 Game no longer recalculates the lod and lighting on watering and cropgrowth. Removed the dialogue functions of the tutorial script. Lag notification now hides and shows timers. Made control hints more visible, and redesigned the mouse fully. Work done to the dialogue format. Fix Farm Fan being able to talk about needing to go see Farm Fan. Fixed Farm Fan not correctly returning to normal dialogue after the gift dialogue has been triggered. Improved error message on config code collision. Fixed some wall objects acting like vines. Simple fixes for a lot of Leif bugs. Fixed some rosemary quest issues. Fixed a bug with Oscar and the Trash Fairy. Made Aliza only visit the cash register in the building store. Fixed beet interference bug with the tutorial. Make most counter tops not push out from walls. Fixed dialogue issues with Oscar. Fixed issues with particles not correctly resetting after resize. Fixed inability to pick up flowers. Minor cleanup of unused code. Fixed fainting waking the player up at midnight. Fixed naming issue with the double beds. Fixed issue with flashing wall torches due to not building emissive color into cached mesh. Reduced tilestates by improving replacetile and merging the remove/place into one action when possible. Fixed bug with sleeping on multiplayer servers. Fixed Farm Fan being removed after festivals where she was the host. Clamped values to avoid generating a NaN. Game now asserts qb layer is of inbounds size. Fixed low drive space detection. Fixed inventory getting stuck and dropping items. Staxel 1.3 – Friendship Update is Live! After a lot of hard work, we’re very proud to say that ‘Staxel 1.3 – Friendship Update’ is now live! Let’s take a look at some of the new content you’ll be seeing in game. The main aspect of this update is adding more depth to the villagers. You can now build relationships with your neighbours by talking with them on a regular basis, giving them gifts, doing them favours and completing their ‘Friendship quests’! Befriending a villager comes with certain benefits; when you get to know them well you might receive some special gifts, and if you take a liking to one villager in particular, you can even invite them to become your roommate! It’s important to choose your best friend carefully though, as you can only have one roomie at a time! Along with all their new dialogue, the villagers’ daily behaviour has been upgraded too. You might find villagers doing more day-to-day activities like shopping in the local store, or having conversations with each other. We’ve found that these changes breathe much more life into the village, and Leif seems pretty happy about it too! Villagers each have special ‘Friendship quests’ for you to complete, if you choose to. I certainly don’t want to spoil the fun by going into detail here, but I will say you’ll really be seeing your neighbors’ personalities come out with this update. Each villager’s quests are unique to them, so by helping out you’ll learn more about them and build a stronger relationship to boot! We’ve added a new fully-fledged Springtime festival, along with a ‘mini festival’ of sorts. Of course, I’m not going to reveal too much about either of these, but what I will leave you with this cheeky sneak peek. Along with all these new systems, we’ve also added a lot of new content too. 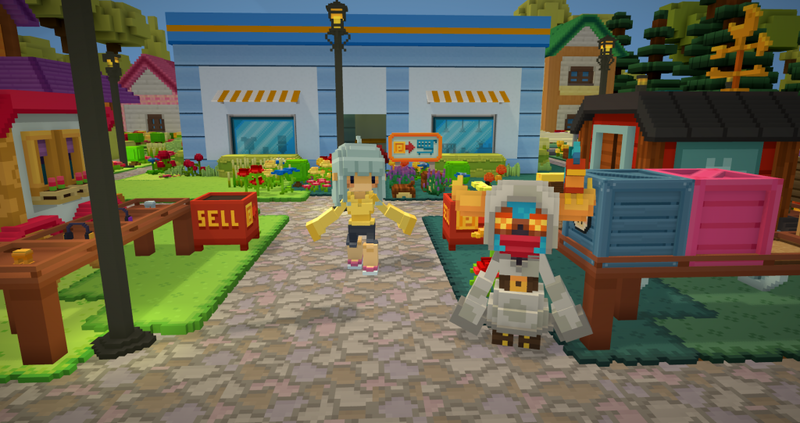 New outfits, accessories, furniture pieces, toys, and even new pets! Some of the new gear can only be collected in specific ways (for example, completing friendship quests), so I’m sure all of you collectors will have a blast gathering all the new loot! This isn’t all you’ll find in 1.3 though, for further information on the changes you can read the changelist below (note that this isn’t an exhaustive list). The best way to find out what’s new is to update Staxel and give it a spin! We’re all pumped with how it’s turned out and can’t wait to see what you all think of it. Have fun! Friendship system: Befriend the villagers by giving them gifts, conversing with them, or completing daily quests. Roomies: Help out a villager enough, become their best friend, and maybe they’ll agree to move in with you! All you need to do is given them a certain special item and make sure you set up your own home’s signpost! Gifts: You can now give villagers items by pressing the correct button with the item selected. New quests: More than 35 new quests spread across 11 villagers, spanning several friendship storylines (Leif, Eris, and Jamie will receive theirs in a future update). New pet type: Unlock an entire new species of pet through Rosemary’s quests! Not even the whole dev team knows what it is! New faces: New storylines bring with them interesting new individuals! New hats: Who doesn’t want more hats? New furniture and tiles: Even more ways to decorate! They can’t be dropped or thrown away. They will always end up in your inventory, even if it is full. They’ll even throw out a random item to make room if necessary! Placeable quest tiles will always return to the inventory when broken. A new festival: Springtime brings with it a tiny disaster. New building tools: Tape measures simplify judging sizes, along with many other handy tools to make building a cinch! When creating translation files for dialogues, the content builder will now filter to .dialogue and .npcconversation files. Plus countless other minor changes lost to the wind. Hey everyone, I think it’s about time we gave you some insight into how development of our next major update is going. Spoiler alert: It’s going great! 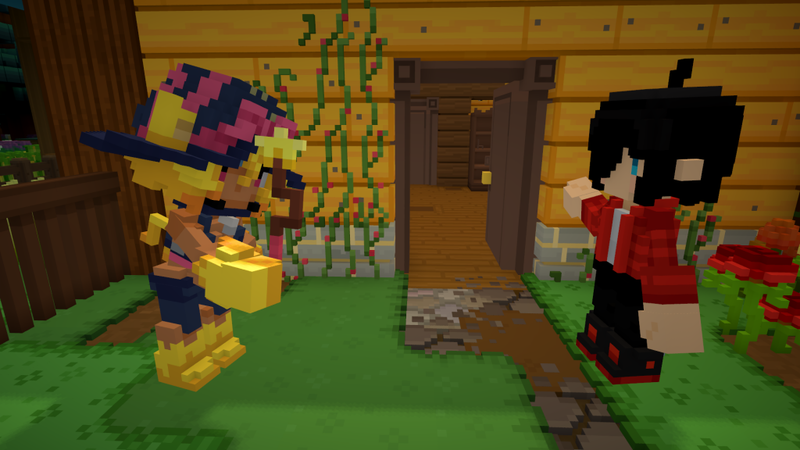 Our next update mainly concerns Staxel’s quirky villagers. We’re adding tons more dialogue content and progression to them and you’ll be able to get to know them all a whole lot better. If there’s a particular villager you’re getting along with super well, you’ll even be able to roomie up with them! This will be the main hub for anything related to your fluffy companion. The store will sell pet accessories, tools, and even some new pets – sorry Fido! Pets are one of the aspects we’ve received an overwhelming amount of requests to add on to. Having this system in place will mean we can easily add new pet breeds to Staxel without too much fuss. As development continues we’re trying to add more and more festivals. The 1.3 update includes a mysterious new Springtime festival, but I don’t want to give away too much on it just yet. We’re sure you’ll all love it though! So now that we’ve covered what you’ve got to look forward to, let’s talk about the current stage we’re at with everything. All of the new dialogue and quests have been written up and are currently with the translators. There’s a whole bunch of new text in this one as you’d expect, we really wanted to put the focus on the villagers and give them a lot more depth. In the meantime, we’re busy making sure everything is implemented correctly and we’re about to enter the testing phase, (we need to make sure that absolutely everything is working correctly and that none of the new features could possibly end up breaking the game). Besides being busy with that, we’ve been sprinkling in some all-new content along the way! While most of the team are busy with implementation and testing, others have been working on some fun new items you’ll be able to get in the game. (Particularly some Summer-themed ones!) Now, I have no intentions of spoiling all the new content but I can give you a cheeky glimpse at some of the new Summer stuff at least. Along with these delicious summery treats, we’re adding swimsuits, beach gear, and toys! Take some time off from the farm and go enjoy the beach! Did somebody say water gun fight? I’m going to stop it here though before I get in trouble. We can’t wait for 1.3 to go live, we’ve all been working very hard on it! This update contains a lot of changes to how Staxel will be played, and we think everyone will enjoy what it will bring to the table. The villagers are much more fleshed out now, and with another festival in the pool you will all be able to celebrate the release of 1.3 in style! Thanks everyone for giving this a read, I hope you’re all as pumped for 1.3 as we are! I can’t give you a specific release date, but what I can say is it’s not long now! – We’ve been having trouble keeping the bot spam under control, whilst only a few slip through the filter to public view, it’s really quite bad behind the scenes and it’s become quite difficult to manage. – With the introduction of GDPR (the General Data Protection Regulation) there are quite a few changes which will need to be made regarding accounts and registration. At this point, considering the reduced forum activity, we feel that closing the forums is the most practical way forward. We also feel that the community experience will be better for everyone if we can focus our attention on a few select places instead of spread out as it currently is. We hope you all understand, and we’d love to see you make the move over to one of our other community platforms if you aren’t in there already! Hey everyone! Today I thought we’d do something a little different. 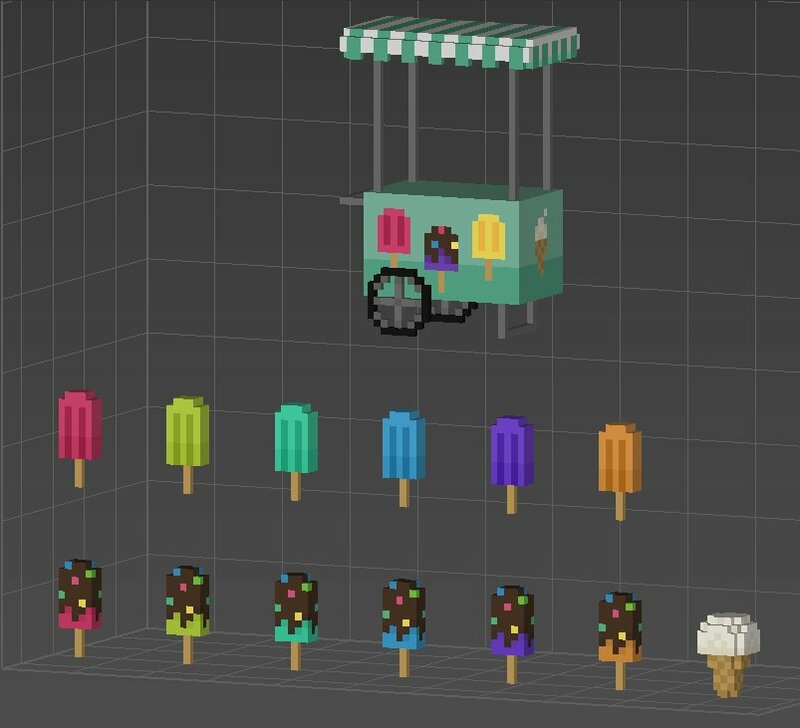 This article is going to take us back to Staxel’s humble beginnings where we’ll take a look at some old screenies and concept art. Enjoy! A very early mockup of the transition of seasons. Staxel’s been through a lot these past 4 years. 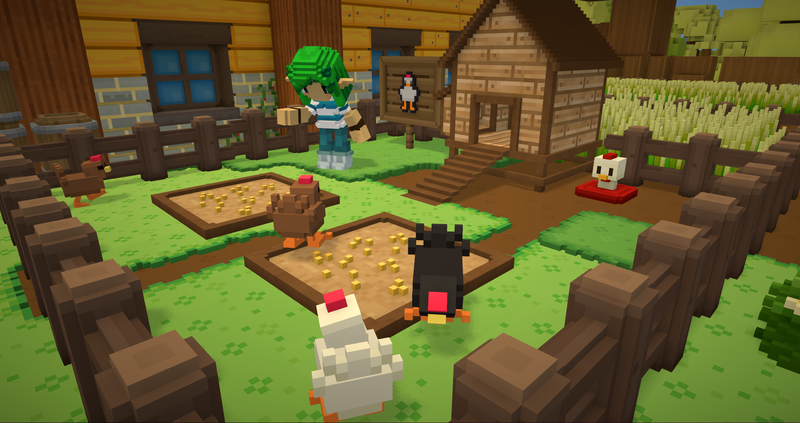 Starting in 2014 it was originally going to be a puzzle game until the team decided to steer it towards the farming, village-life game it is today! Originally you were going to be based on a farm that was transported into the middle of a waste land, along with other ‘divots’ of land from other parts of the world. These ‘divots’ were going to contain a puzzle to solve. The reason we moved away from this idea was because creating these divots proved to be far too time consuming to create just one, where we wanted a lot more. The first two years were heavily focused on engine work. 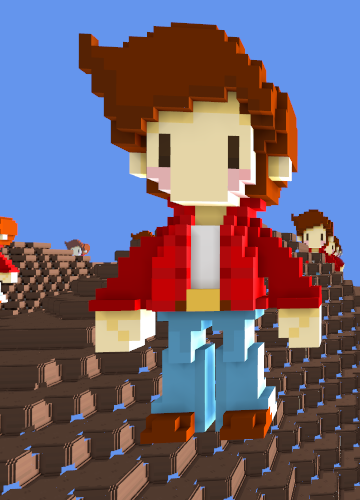 Staxel uses a custom engine which has been developed in-house since the start of the project. While we’re constantly working and improving on our engine, the real content only started being put in a couple of years into development. As you can see above it was well worth the effort! We still have this server somewhere, and us devs boot it up once in a blue moon for a lil’ bit of nostalgia. 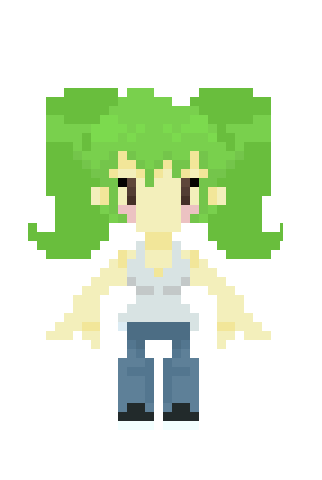 Here’s the first mockup we did for one of our original Staxel characters, “Jen”. It’s actually pretty close to the mark when you look at the style we finally settled on. The main differences being the upper body and the level of detail each villager has. 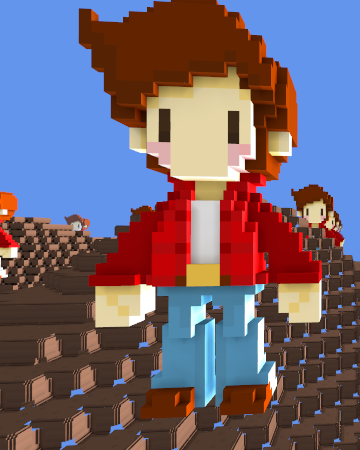 And here is the very first Staxel character, our mascot, Harry. I don’t remember exactly what we were working on when we were adding these but I think it might have been rendering. We had hundreds of these titans scattered across the game world, forever looming over the players. I must say, logging in was much less terrifying once these were taken out. Here’s a screenie of when we were working on the render distance. This one was taken before we’d done any fine tuning on the world gen, and before we had thought of the idea of an island. Back then the world generated infitely. We decided to go with an island because we felt the player didn’t need an infinite amount of space and thought it would take focus away from the farming and village life aspect of Staxel. I’m going to finish up with this old gem. This one was taken within the first couple months of development, where we jokingly titled it ‘Wardrobe Simulator 2014’. It’s always so bizzare going through these old screencaps and realising how far Staxel has come! 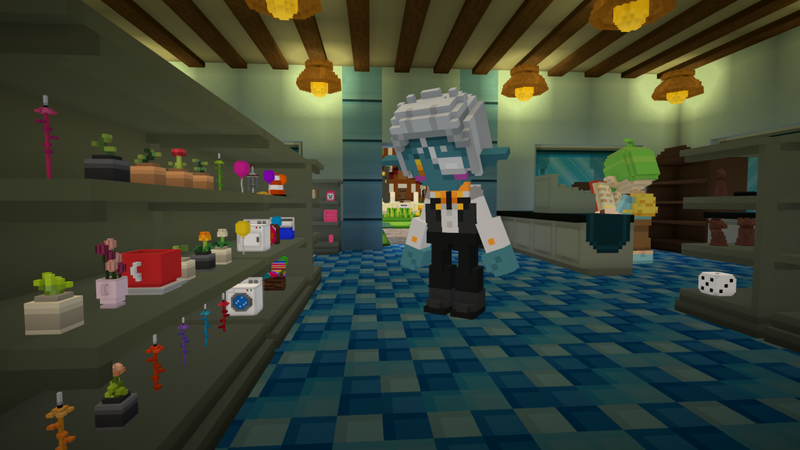 While Staxel is all well and good now, I sure am going to miss all those wardrobes. – Once you reach a new friendship level new events will trigger to learn more about them. 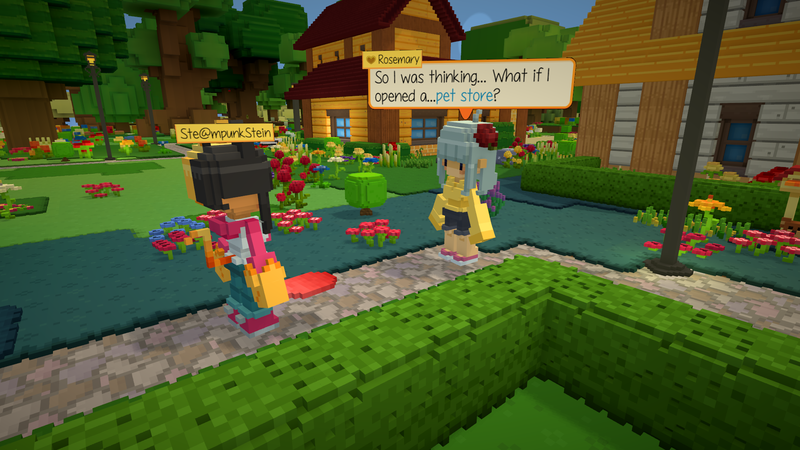 – You will be able to build a pet shop in your town which will allow you to buy new pets, customise them and some other small features. – There may be some new pets to choose from too, but you’ll have to wait and see ! – You will be able to grow and cultivate better quality crops depending on the soil you plant them in and how you take care of them while growing. – There may even be some rarer vegetables to grow for the ultimate farmers out there. 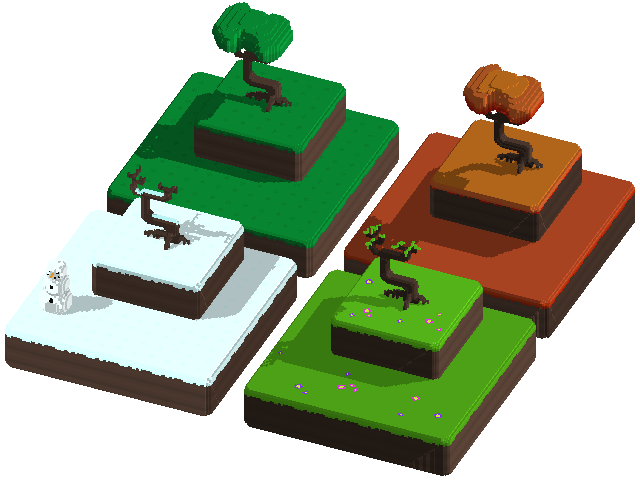 With Staxel 1.2 we bring new features, countless bug fixes, and a more stable experience. In this post we’ll be walking you through some of the most noteworthy changes that we’ve implemented. The journal is our realisation of an incredibly useful feature that many of you have been requesting since launch. In its present state (as of 1.2), the journal provides an overview of all your ongoing quests. 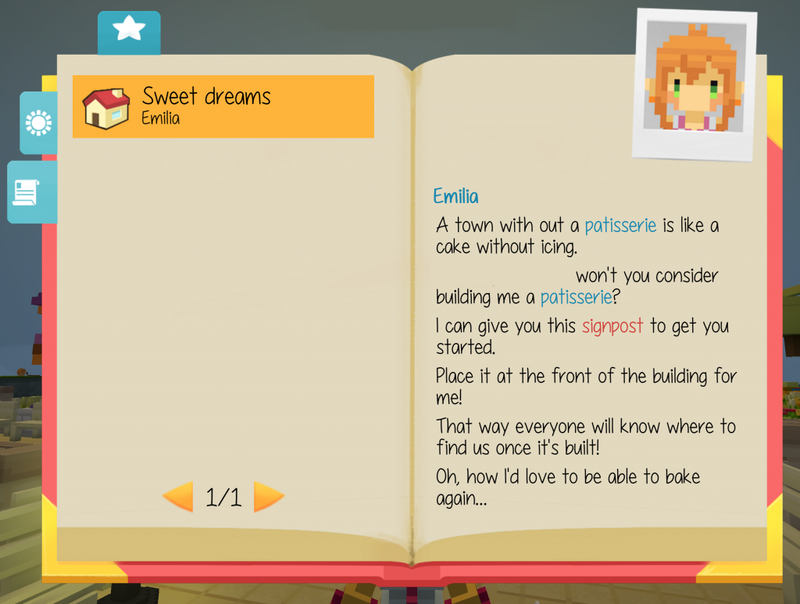 In future revisions, it will also provide detailed logs of your conversations with the villagers, keep track your relationships, let you jot down important notes you don’t want to forget, and provide access to a nifty calendar! Finally, a place to show off and display all of your discoveries! The museum will bring a dash of history to the village and its surroundings. Visitors near and far will marvel at your latest finds! That is, if you decide to donate them to the museum instead of keeping them for your personal collection! 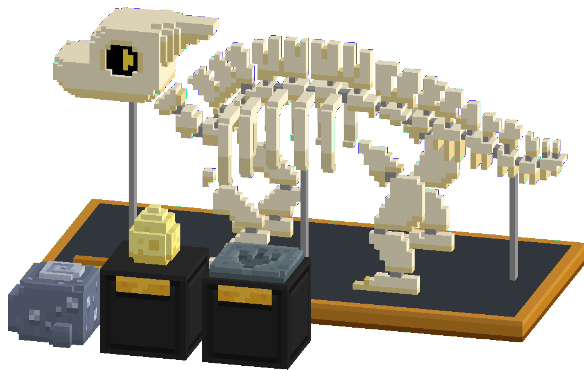 With the addition of the museum, there are new collectables to find! Perhaps you’ll come across a Murmur merchant selling an antiquated work of art, or maybe you’ll excavate the bones of an ancient creature! Max has finally managed to secure postal coverage for the village! The postal system will turn your static post box into a working one! Receive newsletters from the mayoral office, advertisements from the stores, gifts from the villagers, and all the other joys (and aggravations) that come with any mail service! Excavate rare fossil stones you find dotted around the island and put them through the fossil polisher. If you’re lucky you might find the remnants of a terrifying predator! 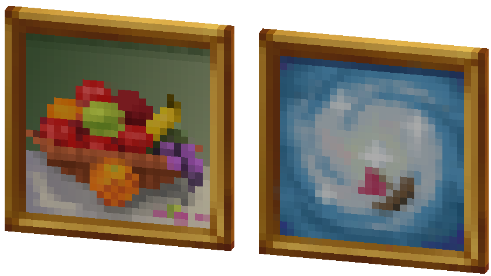 Decorate your home with your findings, or put them on display in your new Museum—under Max’s rather lax policies, whatever you find is yours to keep! The villagers will now be much more grateful when you help them out of a jam! Better rewards and more acknowledgment can be expected for a job well done. We’ve made a number of big improvements to the steam networking feature. Playing online should now be a breeze! The village is always growing, but perhaps not quite in the ways you might expect. In 1.2, you’ll welcome two new villagers to the island, but they won’t be coming by the usual routes! We hope you’ll give them a warm welcome and solve their rather…unique situations! We’ve been constantly tweaking the economy ever since release to try get it to a more sustainable and enjoyable place. While there are still improvements to be made, we believe we’re much closer to the mark now! Mail system. 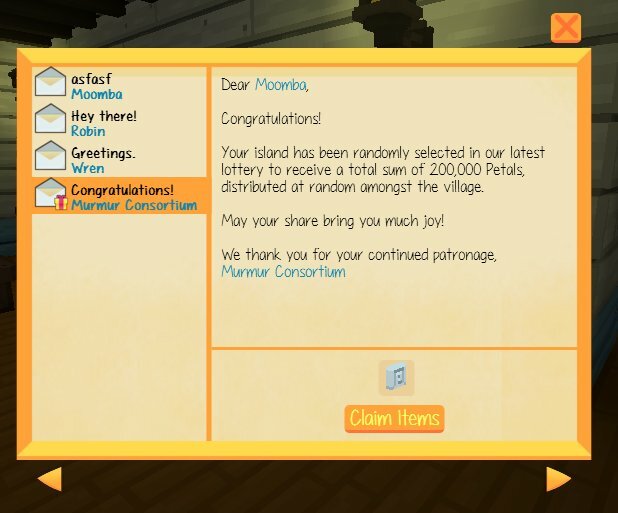 You can now receive mail. Journal. Press J to see your current daily quests and main quests. Museum sign. You can make a museum now. A lot of stuff to put in the museum. A large number of item prices have been changed. Added “/plantwithering”. Turns on/off plant withering. Only recommended for large servers/build servers. You can turn stone and wood back into their original blocks. Added Sushi and Ice-cream recipes. Updates to other food recipes. Food doesn’t get used in creative mode. Pot plant beds don’t trigger house bed counts. Wooden Pole Fence T and X appear in autotiling. Trough should be clearer about why it can’t be filled. Lots of catchable fixes (catching bugs should no longer give you the wrong bug). Fixed double Music track issues. Fixed music playing in Mono. Fixed ambient sound carrying to Main Menu. Fixed totems displaying a notification on new scans. Fixed a number of Steam Networking issues. Sound should be playing in the correct ears now. Selfie mode is disabled when going to sleep. Catching all bugs should now be possible. Fix fishing bobble particles not showing. A number of behind the scenes changes/fixes to Entity Saving and Loading. Watering Can particles and sound are editable. Steam version will remove 32bit DLL’s before trying to load the game. Polaroid has been added to NPC’s. This shows up in journal. You can hide more than just the Hair layer with “hideLayers” in Accessories. “notCategories” is added to AnyOfCategory achievements. To use for filtering out items. Anything using IEntityLogicBuilder needs to update to IEntityLogicBuilder2. From this point onwards, patch notes will be compiled and shared in a biweekly post. This way, we won’t clutter the announcements section while still giving major improvements and additions to Staxel the spotlight they deserve. Cards and Emotes are now avaliable! New camera mode, “Selfie Mode”, when pressing X. Flowers drop petals for crafting. Tutorial Skip for players who have been through the tutorial once before. Text Speed option. It can be made 5x faster. Less Out Of Memory Errors. Less Purple Screens. Improved lower end performance. Performance Stability should be increased. Graphics Card usage is down. Note: Reported memory usage (RAM) is up. This is due to Staxel not hiding memory in the Page File anymore. All postboxes and signs (Totems) have two tiers. Shops won’t immediately die when you take their boxes. Important signs also give a warning when you break them. A lot of price changes have been made. A lot of work has been done to lower Hard drive usage. It is now under control. World generation and Level Of Detail generation have been sped up. Tutorial changes, most for those not the admin of the server. A large number of fixes were made. Game should crash less, and more systems should work as expected. It’s been crazy since release so we’ve been busy processing all the feedback we’ve received. We want to let you know our goals for the next major update so that you know what to expect. We know some people have had some trouble setting up servers and playing with their friends. Since this is a big part of our game we want to make it as easy as possible. We’re currently looking into improving steam networking so it won’t be difficult for new players or people who don’t know how to port forward. After hearing that some people get lost or don’t know what they need to do in game, we’ve decided to implement a journal that will contain a lot of info and will track your progress along with any quests you have. For example, what buildings you have been asked to make or who to deliver that package to! We hope this will create a better experience for people who want to have all that info in one place. We’ll be adding a museum questline which will allow you to add a museum to your village. Add your bugs and fish to complete it so that you and your friends can view your collections in style. 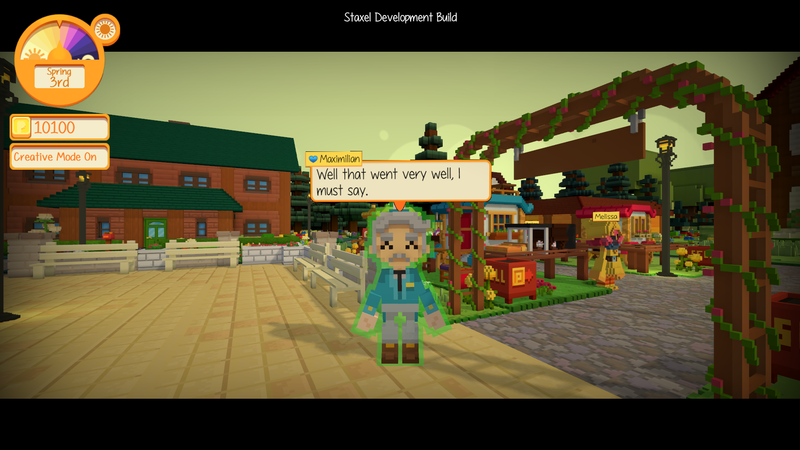 We’ll be adding more quests and stories for villagers so that you can continue helping out the people in your town. This will also include better gifts for helping them out so it will be more rewarding ! In addition to that you will also see us upload small updates with bigfixes and small changes. The very rough timeline we have for all these features to be implemented is around 1 month. After nearly four years of development, and our team growing from a small two-man operation to nearly a dozen hard-working developers, we have finally published Staxel to Steam! As you can imagine we’re all feeling a mix of excitement, pride, and nerves over this and we can’t wait to see what you all think of our game so far. While we still have so much we’d like to do, we think you’ll all certainly enjoy what’s already there! As you can see, Staxel has come a long way from its humble beginnings. It started out as a basic creative builder, with not much other than an open world and a handful of tools and building blocks. Since that point we’ve kept on adding more and more of the content and systems we’d had in mind until we reached a point where we were happy to show the world what we’ve got. 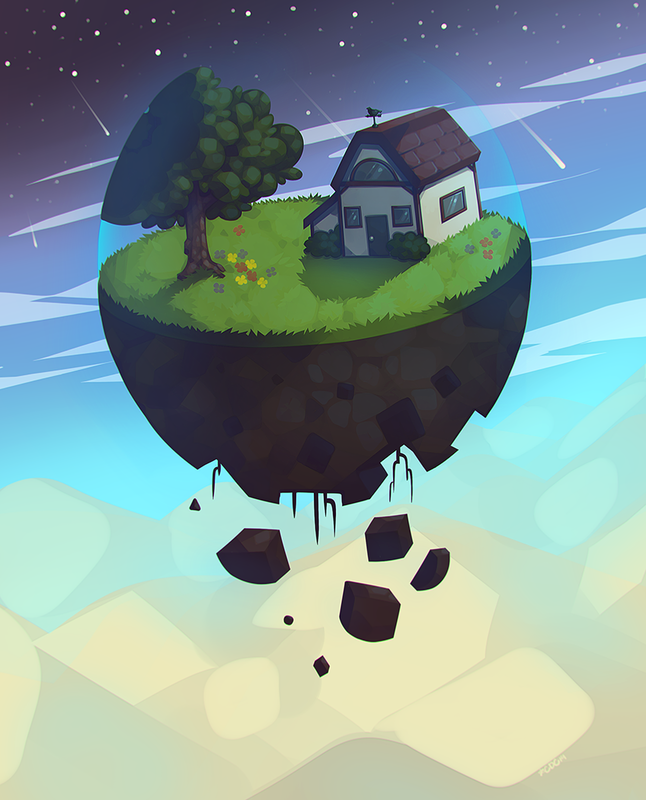 It’s been a wild ride so far, but now begins a totally new phase for Staxel, and we’re super excited to get started! This brings us to a very important point, and one we’re forever grateful for. We’d like to take a moment to thank our fantastic community for all the support you’ve given us and for all the fun we’ve had with you over the past few years. We’ve had a blast gaming with you, chatting with you and spitballing ideas. All the way from the tiny IRC channel we started with to the busy and friendly Discord server we hang out on together now. Thanks guys, we’ve seriously loved every minute of it, and without you, it goes without saying we never would have reached this point! With that, we hope all of you have a blast with Staxel! 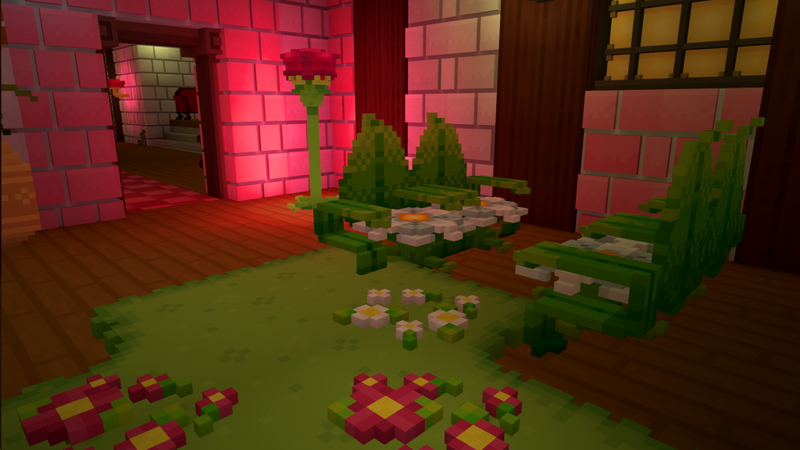 Keep an eye out as in the coming days we will be posting another article outlining some of our plans for Staxel’s development, including plans for new features and such!